The more than 20.000 units built were put into service by the German army on all fronts and other nations like Italy, Bulgaria, Spain and Finland. Some captured FlaK were used by the United States and Greece. In case of the US Americans, the 79th Field Artillery Battalion used captured German artillery pieces during an ammunition shortage, as well as the 244th Field Artillery Battalion. 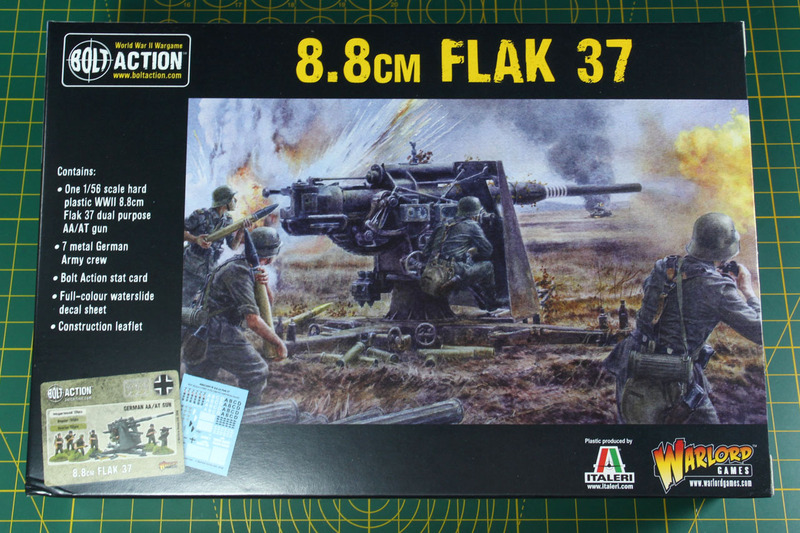 Surviving examples of the 8,8 FlaK can be seen among other locations at the Panzermuseum Munster, WTS Koblenz, Imperial War Museum in London and Museo Histórico Militar da Coruña. 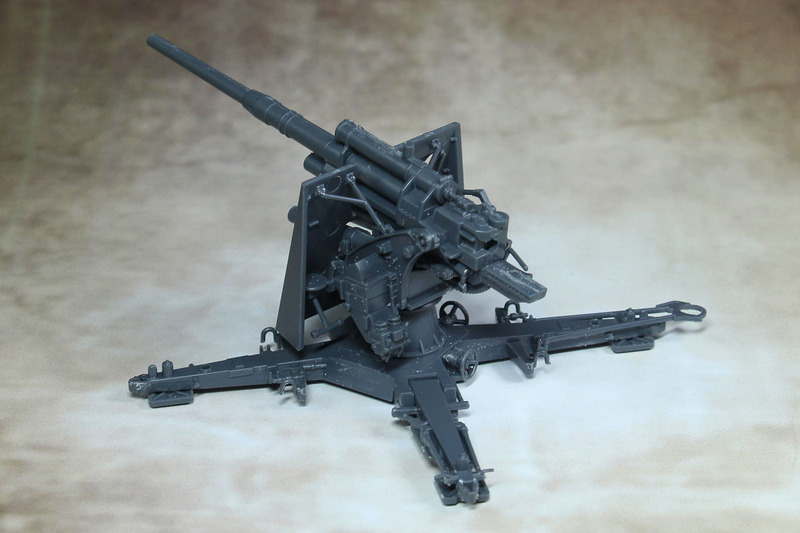 This is a metal-plastic kit, with the FlaK itself provided by Italeri and the crew of 7 made from metal by Warlord Games. 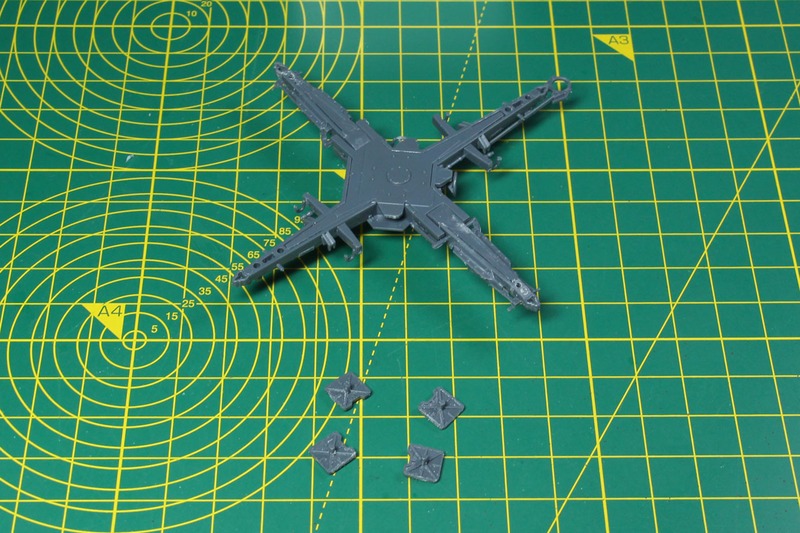 Price sits at 25 GBP for the box that comes with two medium sized sprues, the miniatures with 6 plastic bases (one of them sits on the FlaK itself), a stat card, a decal sheet and a multipage construction leaflet. Casting is okay. 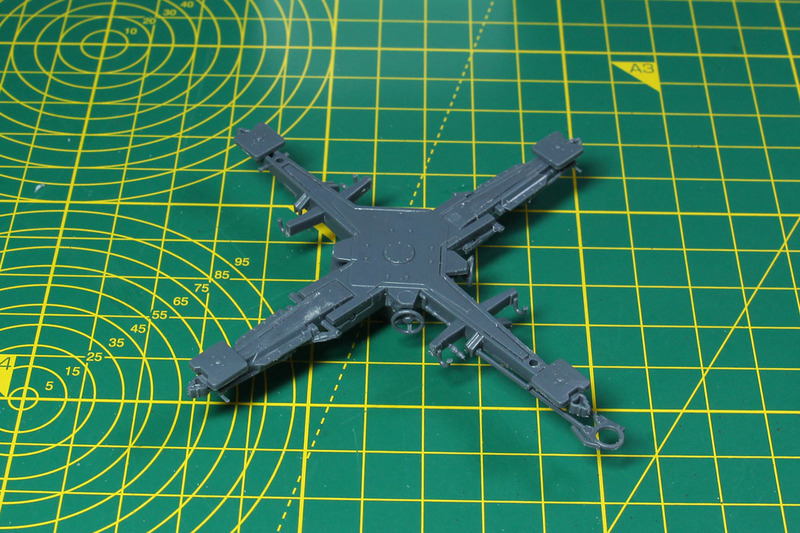 There are some mould lines and a bit of flash to clean. 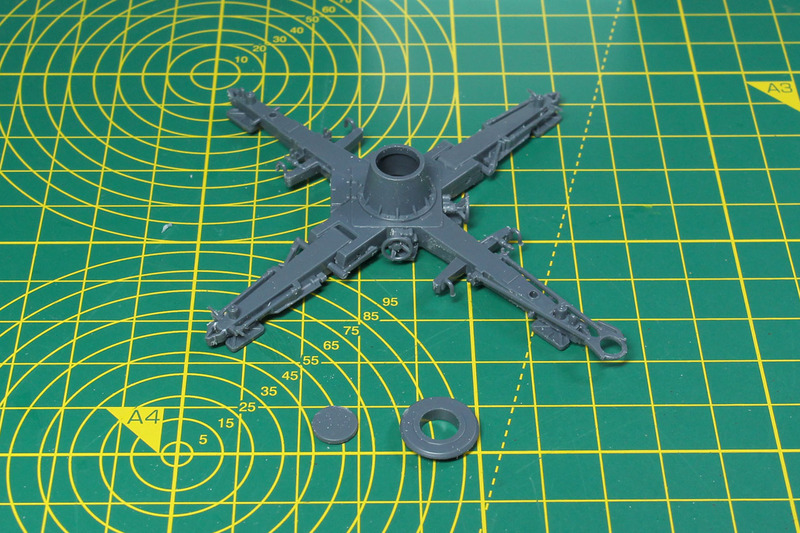 Some parts are rather fragile so you have to take care while cutting them from the sprue. 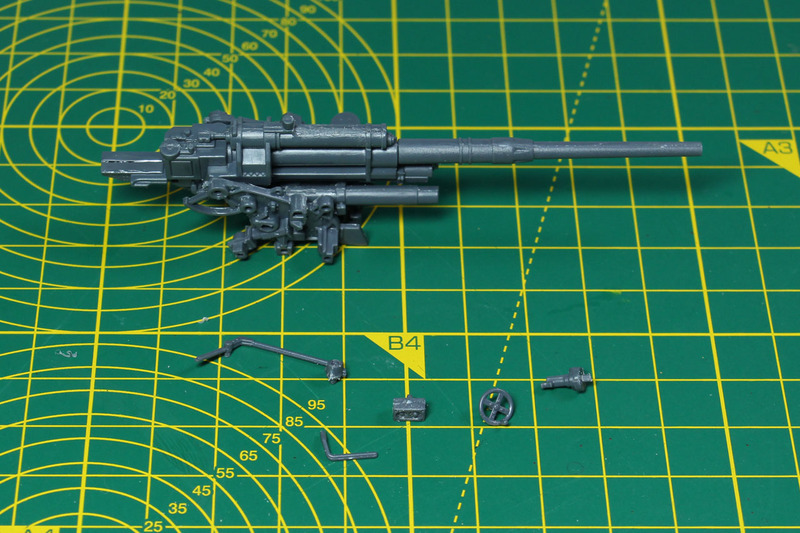 Assembly starts with the gun itself. 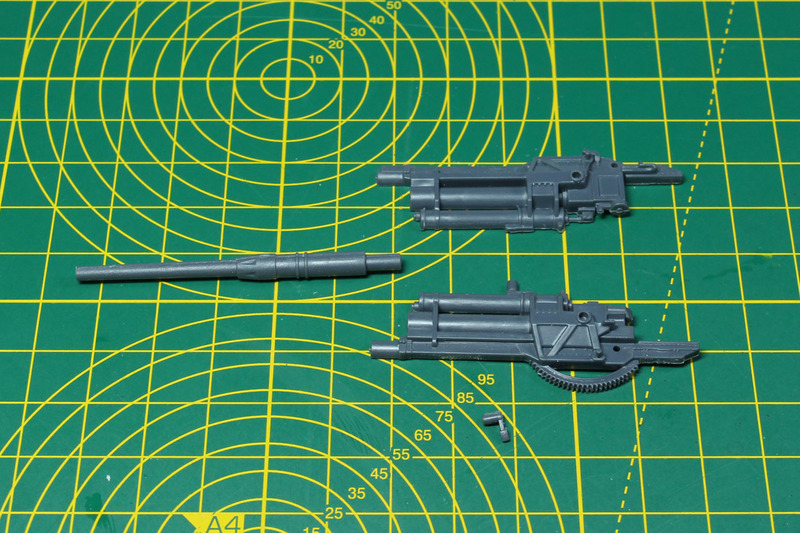 Make sure you go with minimal glue on the two cylinders, as there will be two pins (see third picture) be inserted to them, and they have to still be able to move, to elevate the gun. 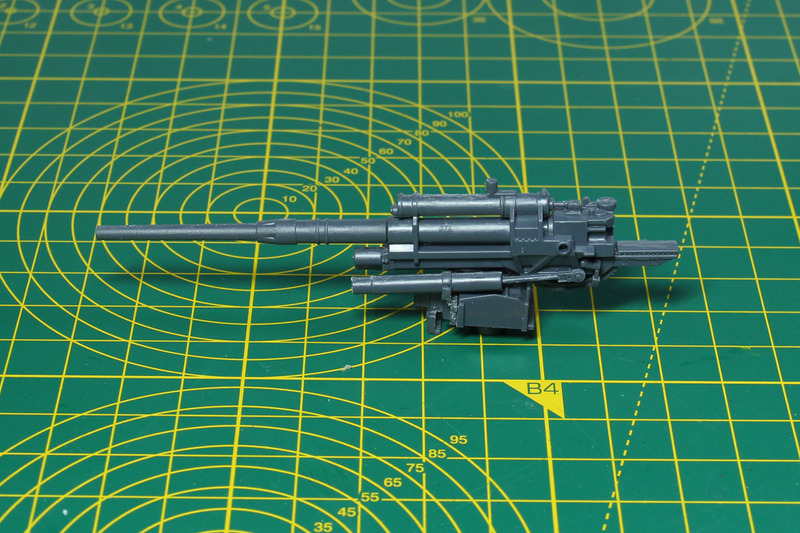 After the gun itself is assembled and the mount is ready, the outer mount is added. 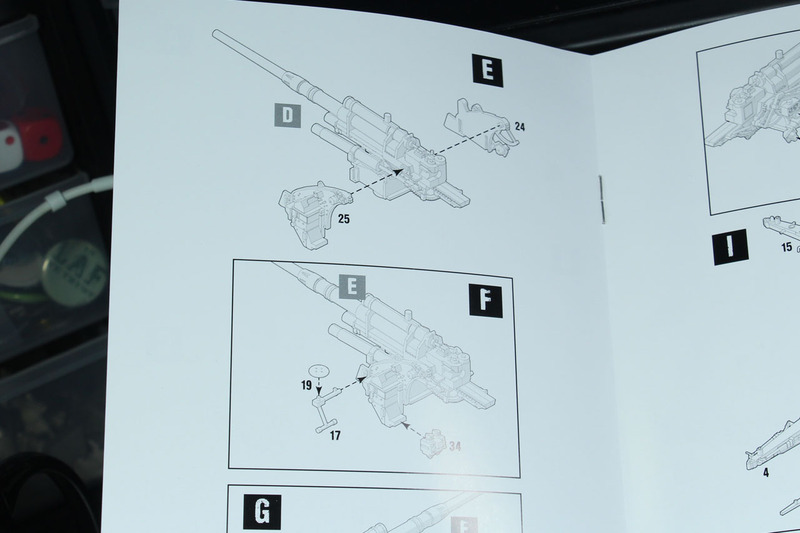 Unfortunately I forgot to take a picture of the unbuilt left side, so I added the step from the instruction to see what we're missing. 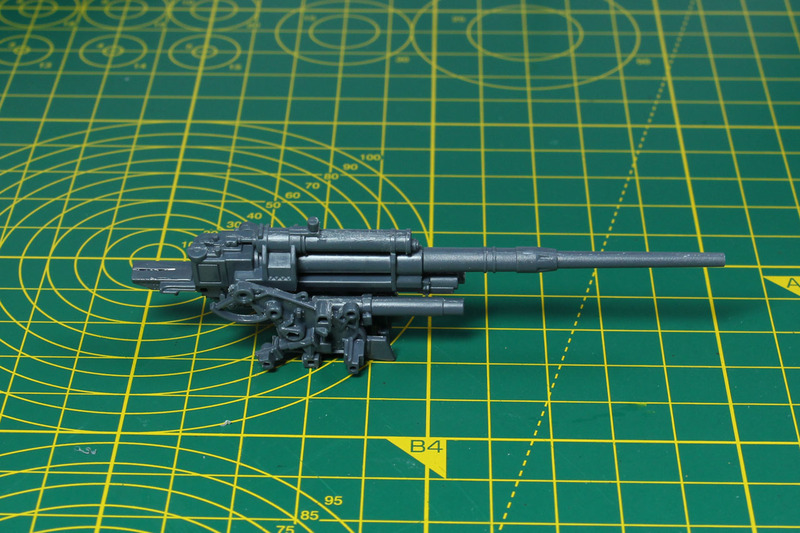 Now the right side of the gun is added, along with several cogs and wheels to gear the gun towards its aim. 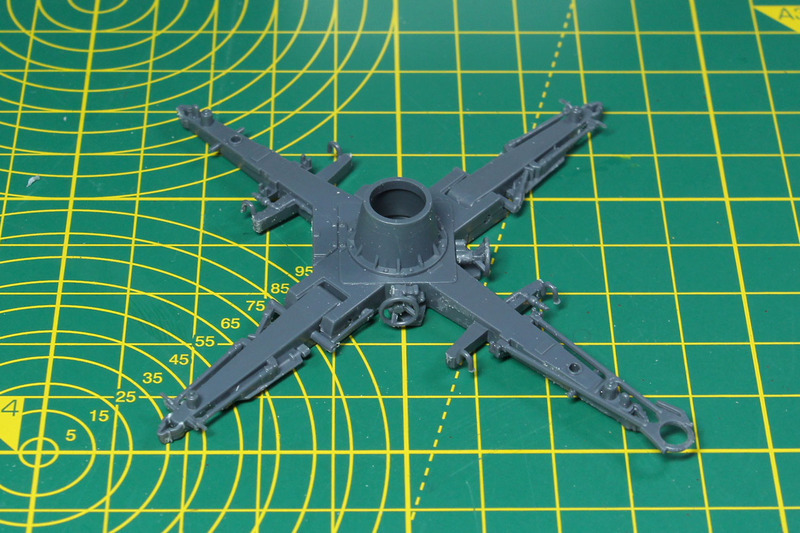 Along with even more handles and wheels, and the seat for the gunner / spotter. 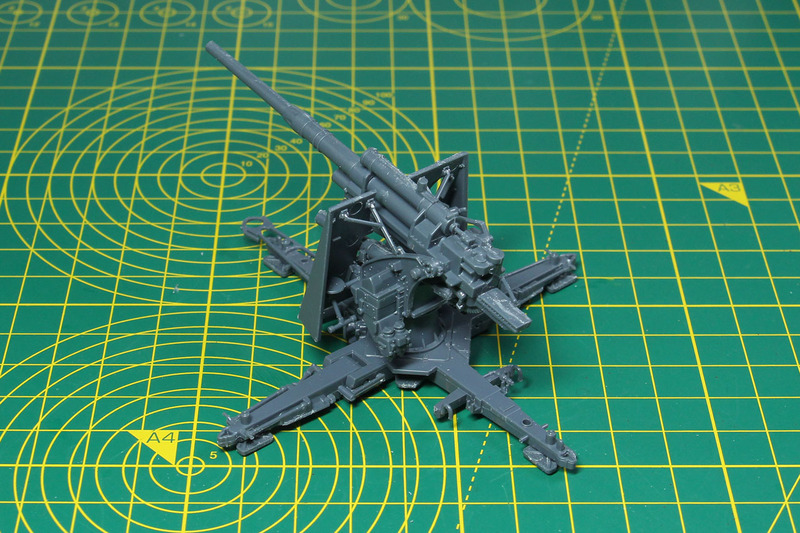 Now the well-known cruciform gun carriage of the large gun is assembled. The carriage has a long piece and two moveable bits, which are folded for transportation, when it was loaded upon the Sonderanhänger 201 or 202. 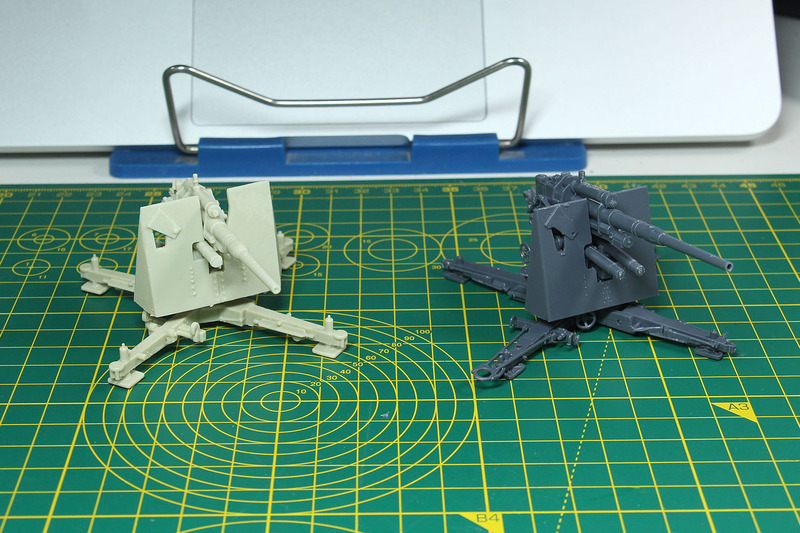 In this step the wheels and towing hook is added to the gun carriage. 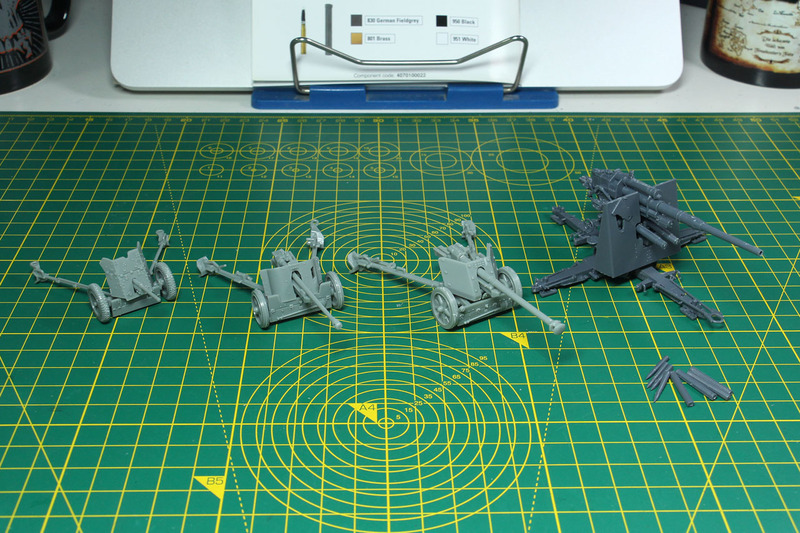 Now we turn the carriage over to add the ground plates. 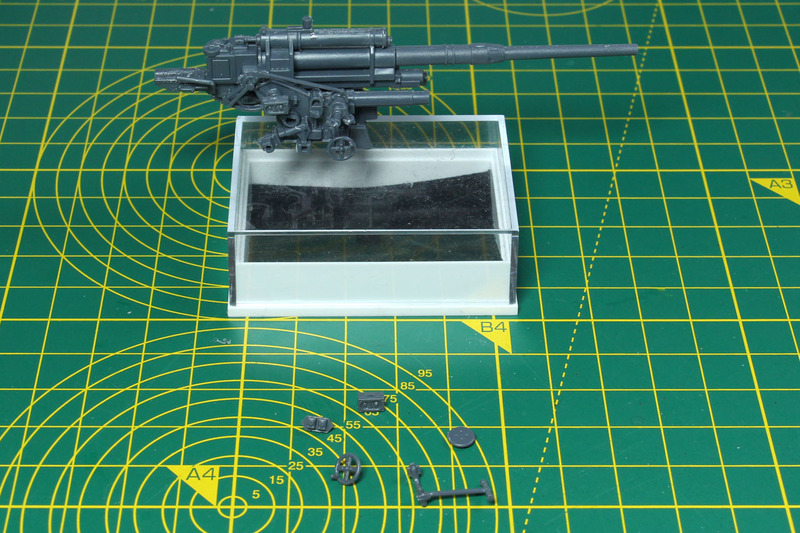 And the ring mount for the gun to be added. 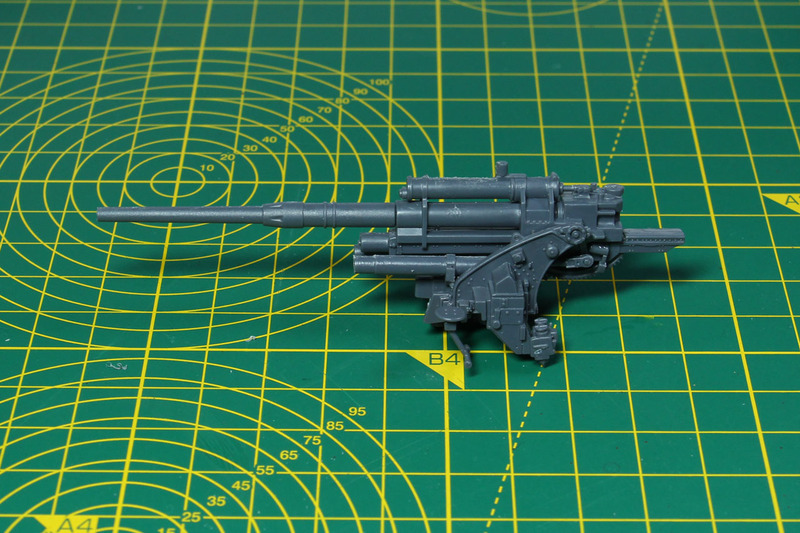 Only the mount needs to be glued, as the gun itself can just the put upon and stays moveable. 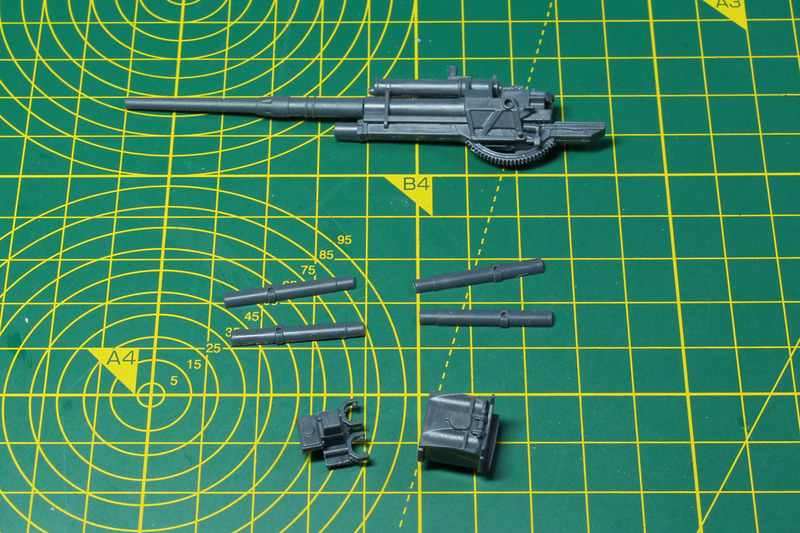 Last part of the assembly is the gun shield. 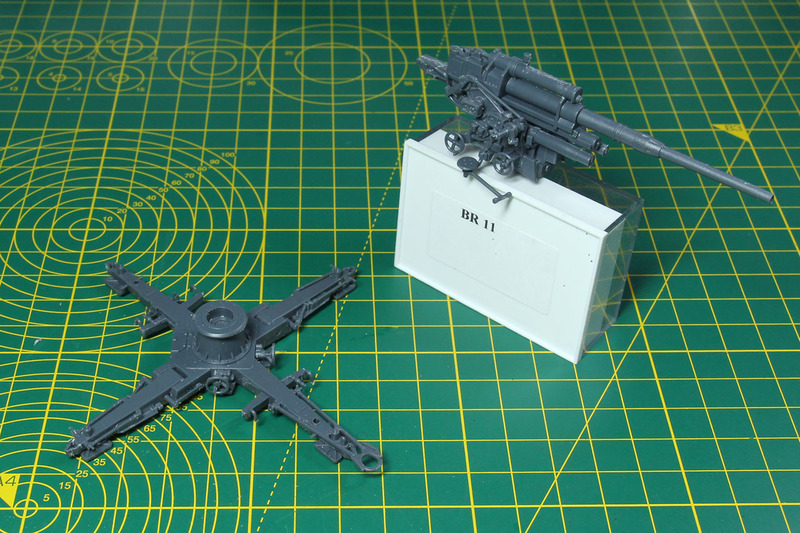 Along with a two support beams. 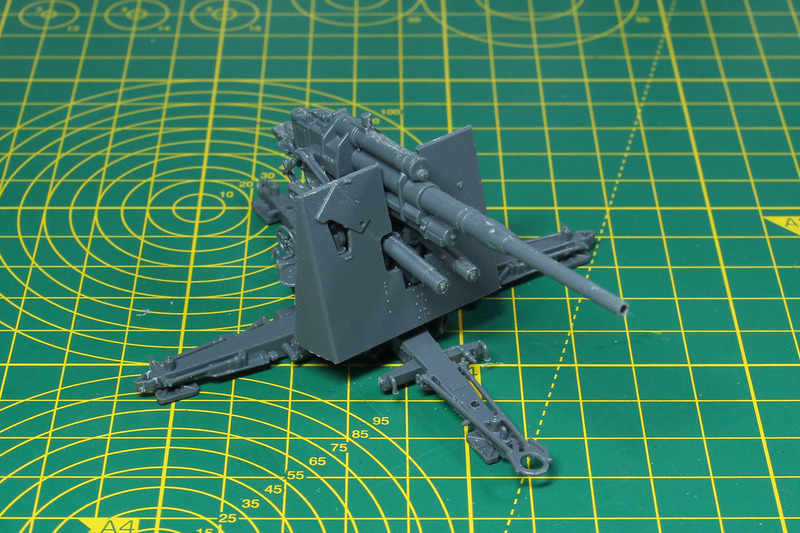 This is actually an optional step, as some 8,8 cm FlaK didn't use the gun shield at all. 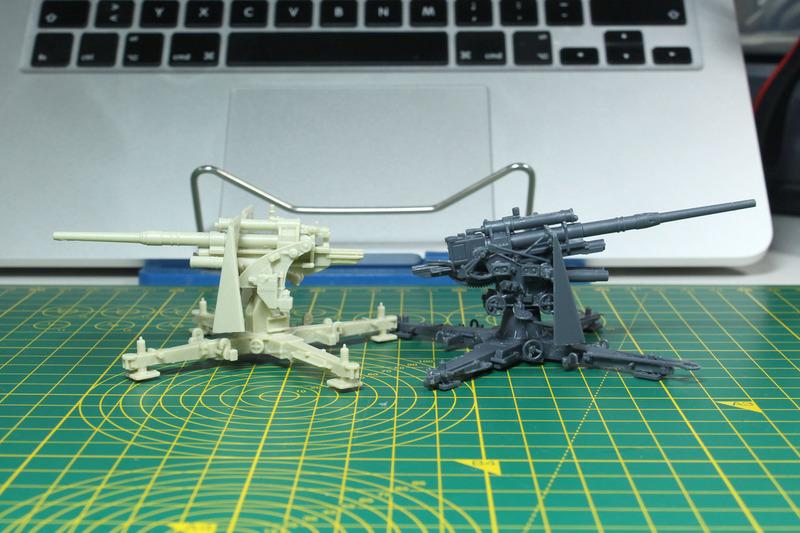 Fit of the support beams is mediocre and they are delicate. 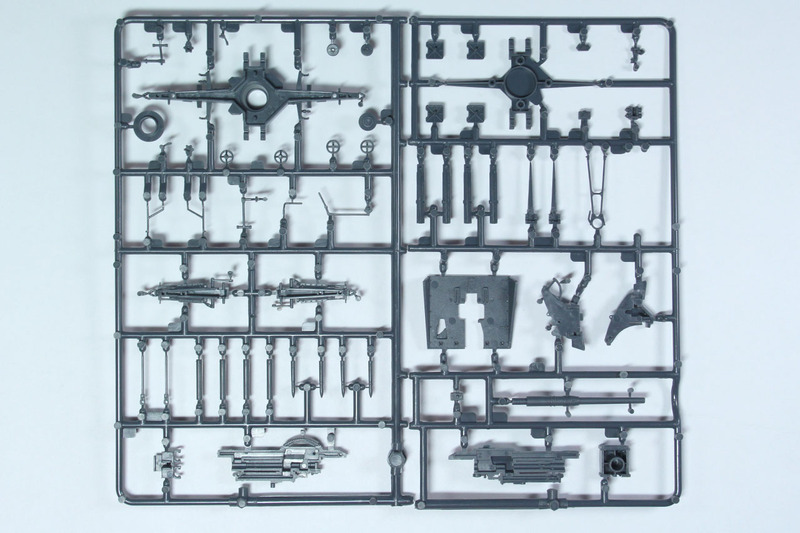 The sprue covers a couple of single shells and ammunition canisters you could spread around the base / gun. 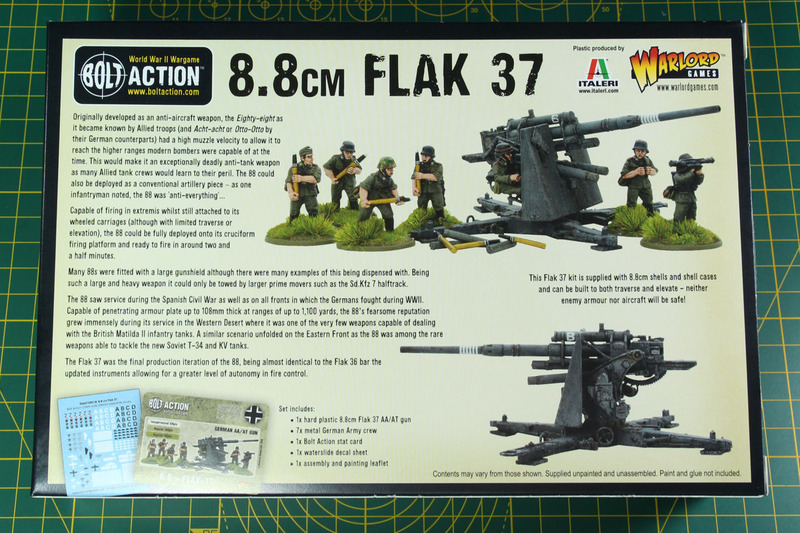 Comparison of the FlaK next to this week's several PaKs we've covered, from 36 to 43. 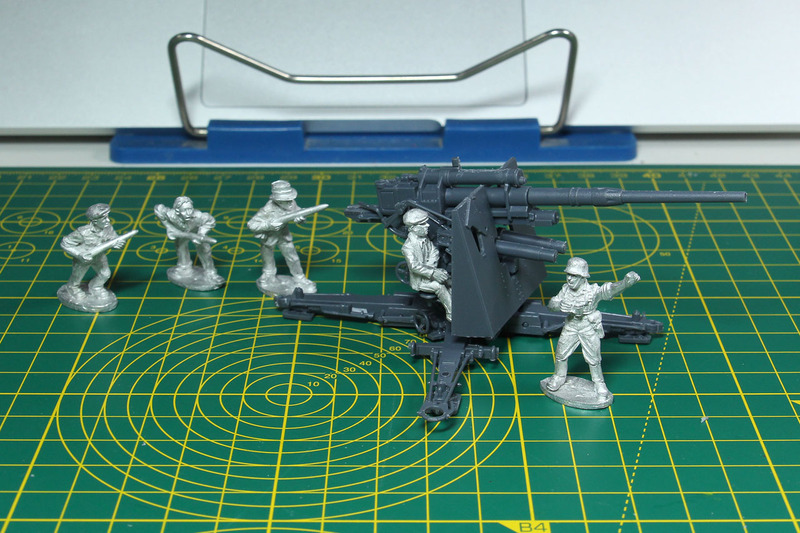 And a direct comparison of the FlaK by Blitzkrieg Miniatures and the Italeri/Warlord one next to each other. 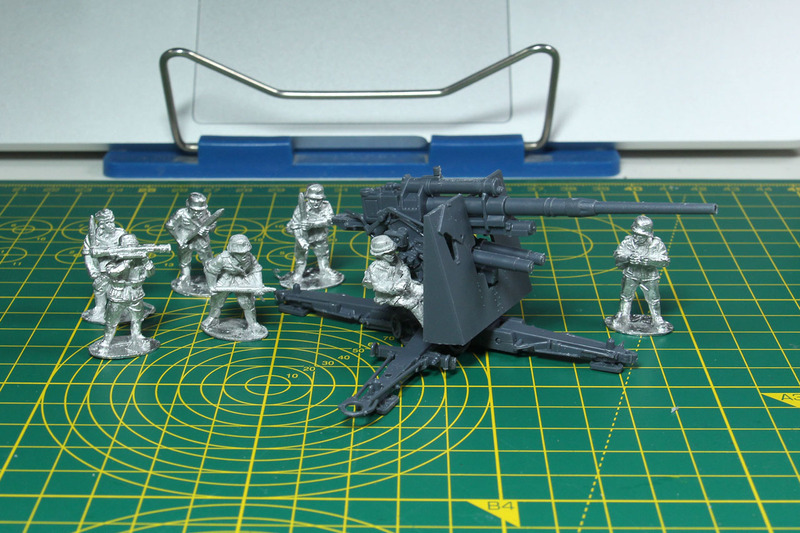 Warlord Games offers this kit with regular Wehrmacht soldiers. 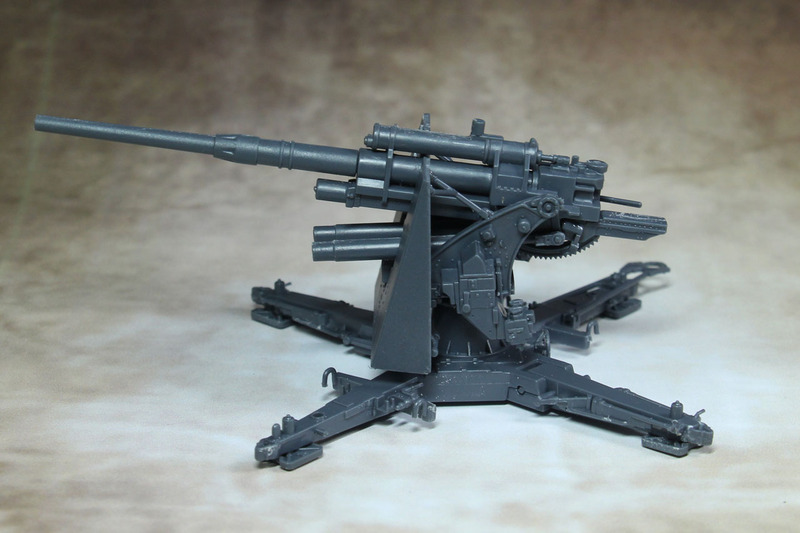 You can already pre-order it with a different Afrikakorps crew for the Western Desert supplement. 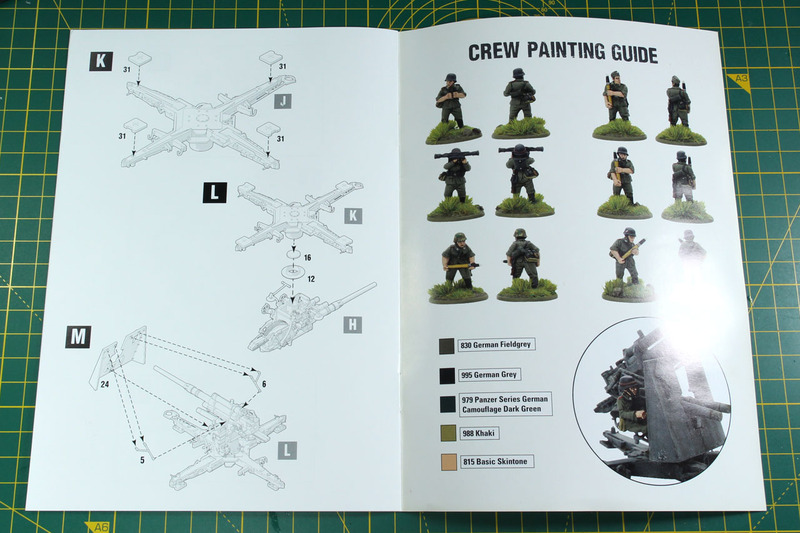 Other companies like Perry Miniatures or Empress offer FlaK crew as well, here shown the DAK crew by Perry Miniatures and the Spanish Civil War / Volkssturm crew by Empress. 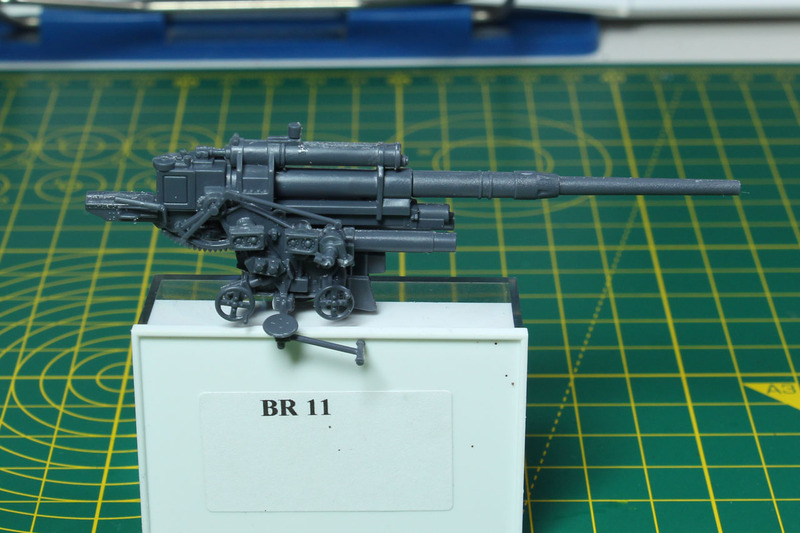 The later is sculpted by Paul Hicks who did the early Bolt Action miniatures as well, so they fit quite well with the range. 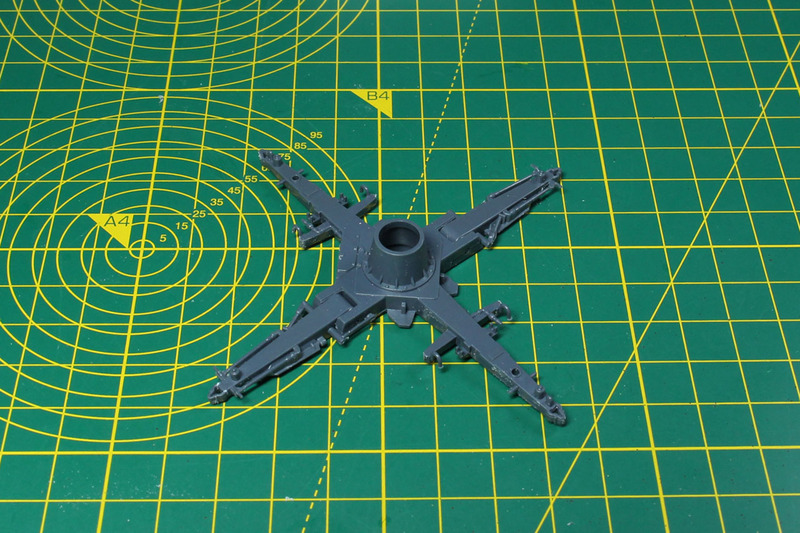 Of course, the last few pictures are as always the assembled miniature in front of a backdrop. Many people were and are looking forward to this kit, but to be honest, I expected a bit more from it. 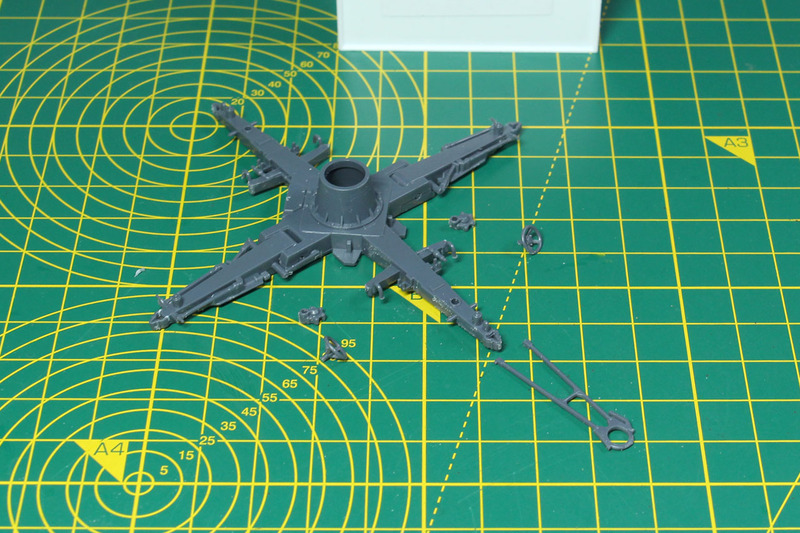 The plastic kit itself is too much of a model builder kit, with lots of small pieces and some that could easily be combined for a more pleasant building experience. 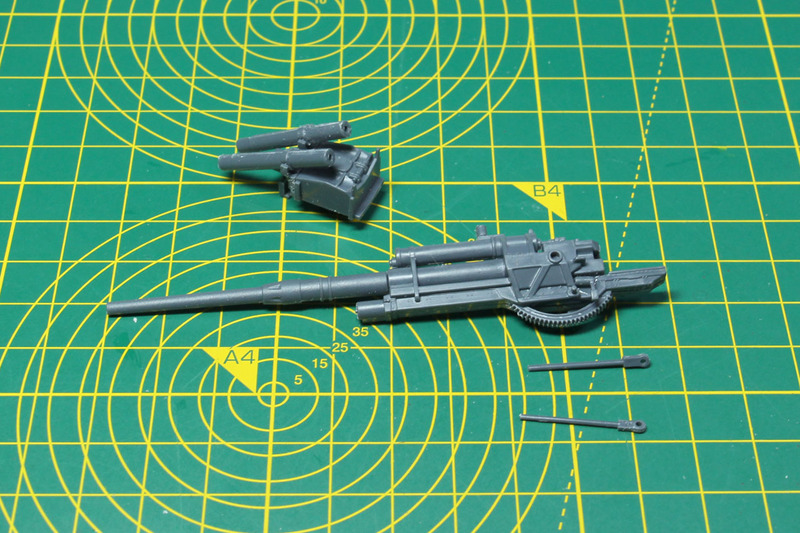 Some parts don't really fit, like the seats and have to be bend to actually fit behind the gun shield. 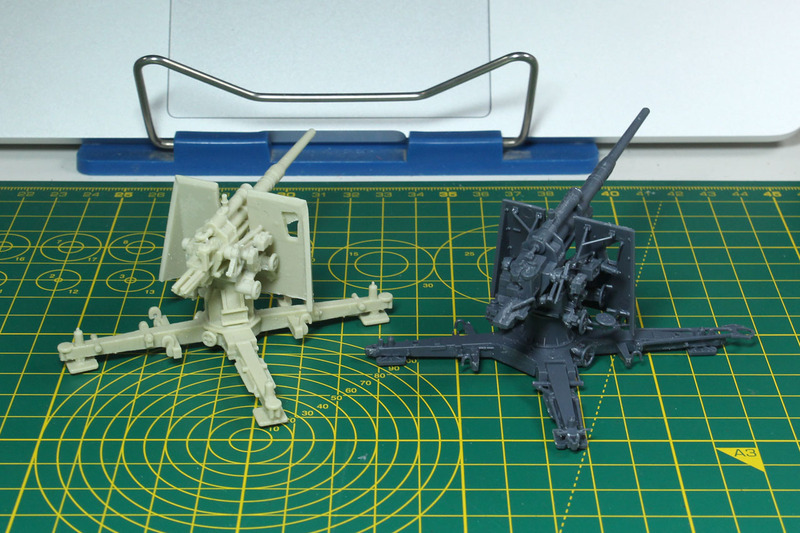 Casting itself is mediocre, as the mould lines and flash was above average from what I'm used to by Italeri and/or Warlord Games. 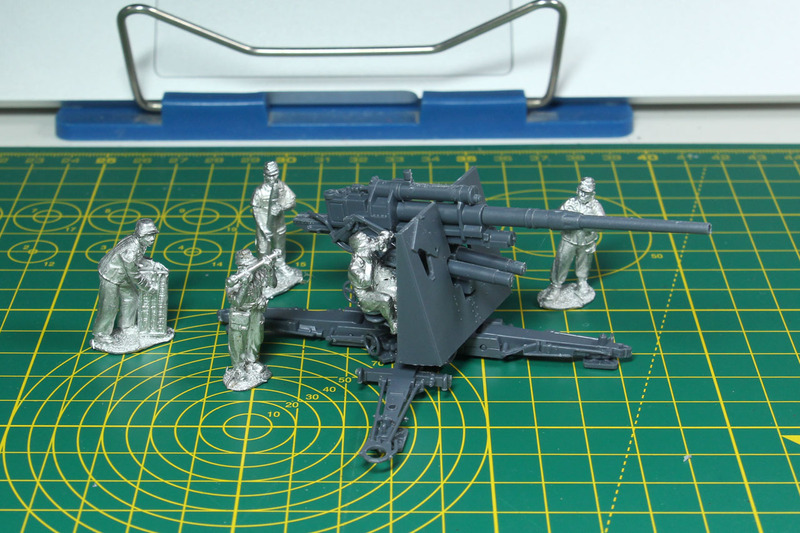 The crew is most certainly from the old Bolt Action range, as is the Afrikakorps crew from this year's pre-order. 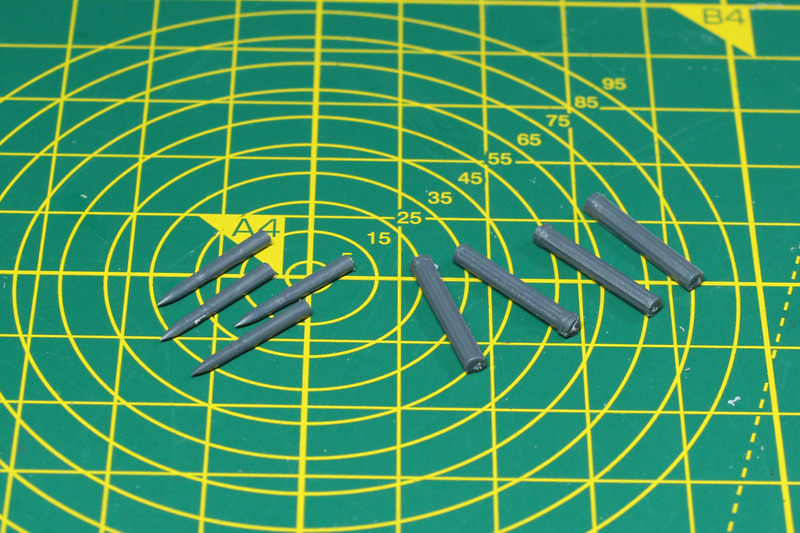 Due to that, they are on the smaller end of the 28mm scale miniatures and have aged compared to other miniatures from the Bolt Action range. 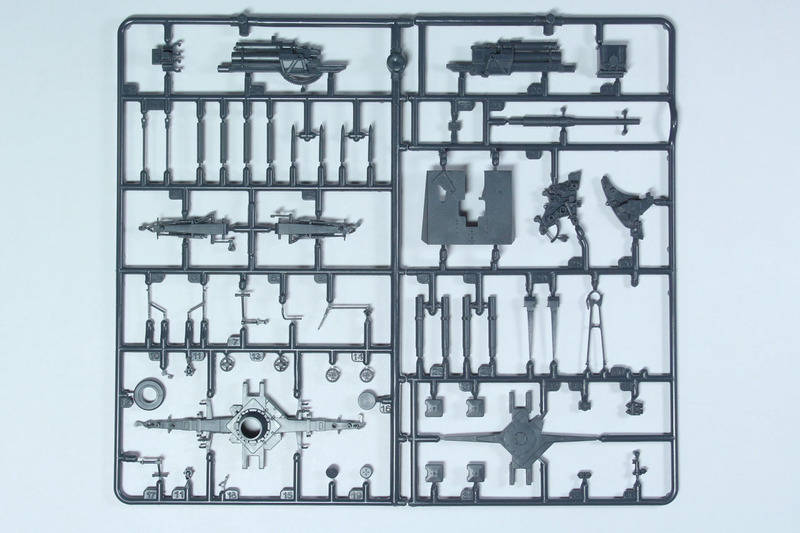 As they released this kit as a plastic kit, they could have included the limber. 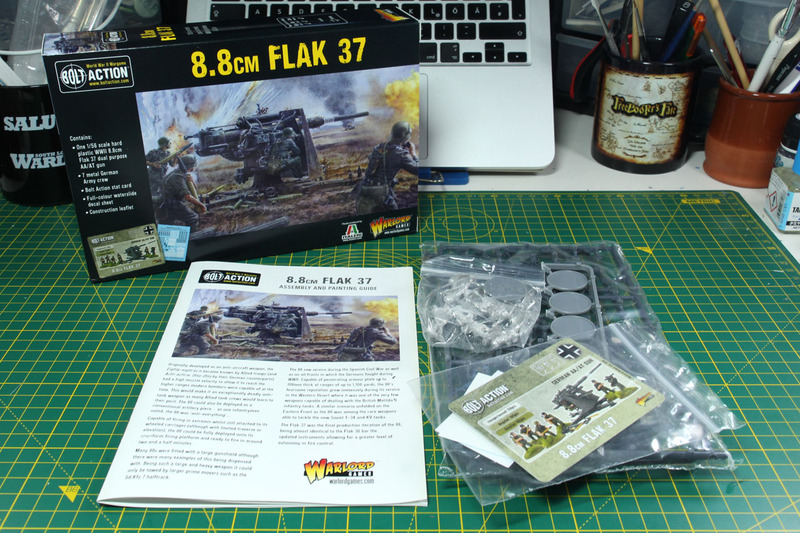 Warlord Games offers another FlaK kit, made from metal, with limber and the same crew for 28 GBP. So for 3 GBP more, you'd get the limber. 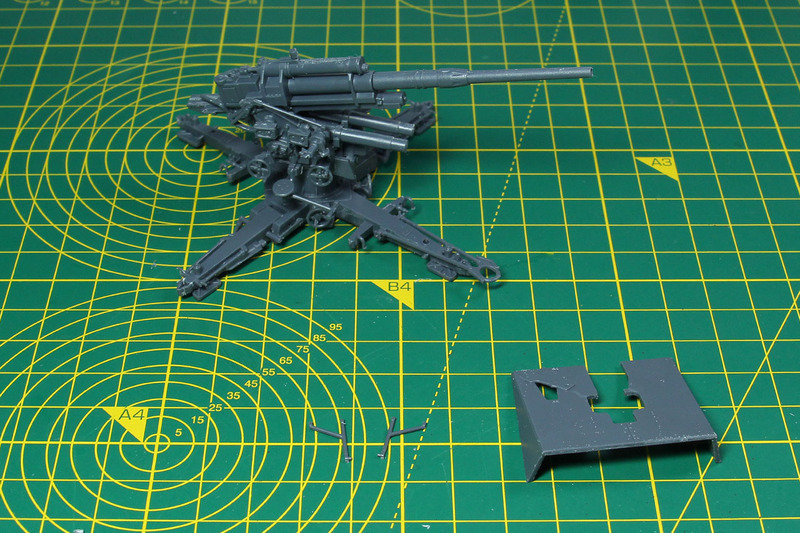 A more difficult to build kit, as building something as large as the flag entirely from metal, but still. 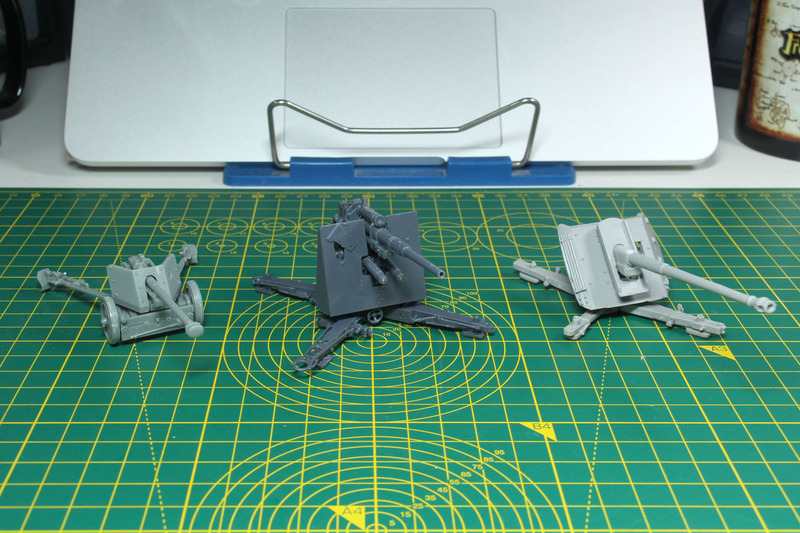 This kit will have a hard time, once the already announced FlaK kit by Rubicon Model will be released, that will cover the limber as well among some other options. So if you have the time, I'd suggest waiting in this case. 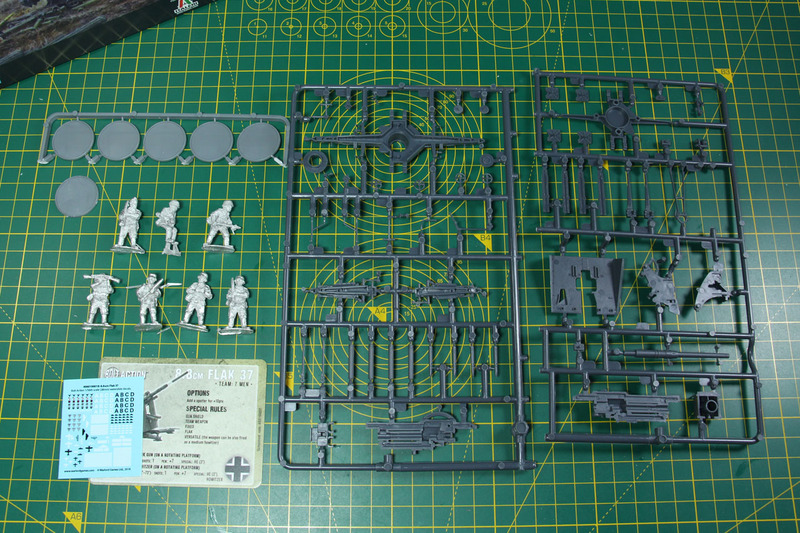 Otherwise this kit is still cheaper than the 22,50 GBP for the Blitzkrieg resin kit, as it already covers the crew and easier to acquire. 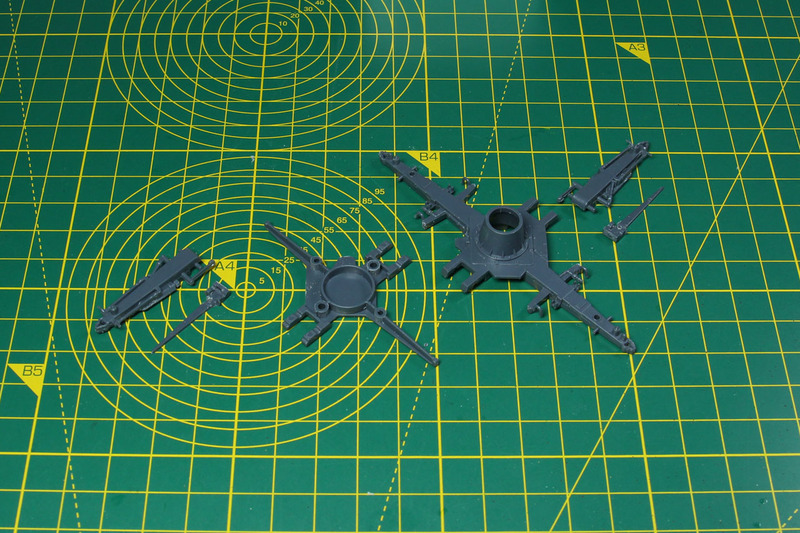 Beyond that, the 8,8 FlaK could be used for a couple of what-if and field conversions. You could put it on a Sd. Kfz. 9 or PzKpfw. IV. 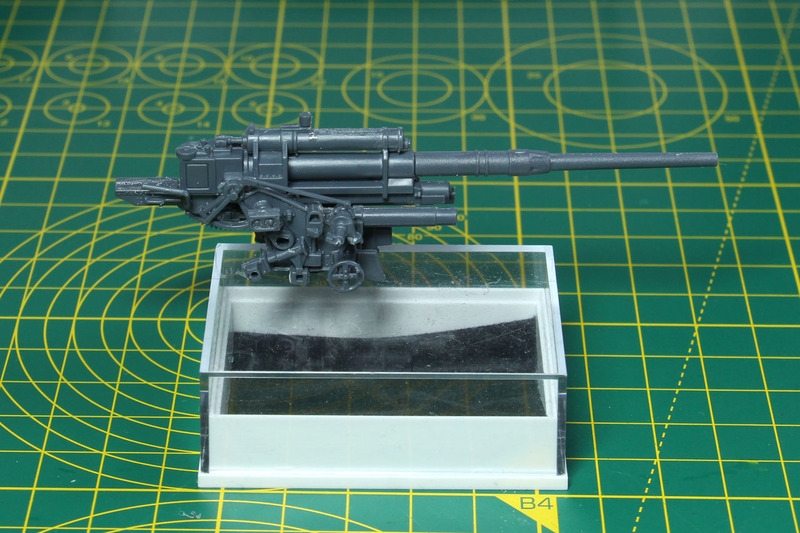 The picture with the 8,8 cm mounted on a T-34 is a fake.